Treasury Secretary Timothy Geithner said Tuesday that the United States and China have reached agreement on the need to work toward more balanced global growth once the current economic crisis has ended. Geithner spoke as the two countries were wrapping up two days of discussions aimed at seeking to narrow differences on a wide range of economic and foreign policy issues. "Our two nations are committed to a strong and stable international financial system that will contribute to more stable, balanced growth globally," Geithner said as he and top Chinese economic officials resumed discussions on a variety of economic issues. In his opening comments, Chinese Vice Premier Wang Qishan voiced support for a key U.S. goal that China shift to more domestic-led growth rather than depending so much on exports that drive up the U.S. trade deficit. "China will focus on boosting domestic demand and in particular consumer demand," Wang said, speaking through a translator. He and Geithner sat at the head of a long conference table set up underneath massive chandeliers in Treasury's ornate Cash Room. Geithner was accompanied by National Economic Council Director Lawrence Summers and U.S. Trade Representative Ron Kirk while the Chinese team included Zhou Xiaochuan, head of the Bank of China. The economic talks on Tuesday were expected to focus on the need to fight against erecting protectionist trade barriers during the current economic downturn. Another topic was to be the overhaul the global financial organizations such as the International Monetary Fund and the World Bank to give emerging economies such as China greater say in the operation of the institutions. "We can build upon our joint response to the global financial crisis by continuing to provide constructive leadership and support for the institutions underpinning global financial stability," Geithner said in the meetings being held at the Treasury Department. Secretary of State Hillary Clinton was leading a separate set of discussions at the State Department focused on foreign policy concerns, including the need to restrain North Korea's nuclear ambitions. The topics on Tuesday were to include assisting poor countries in fighting infectious diseases and efforts to improve the functioning of global energy markets. The two days of talks were scheduled to wrap up later in the day with news conferences by both the U.S. and China and the issuance of a joint work plan to set the agenda for coordination between the two nations over the next several years. While officials of both the United States and China were striking a conciliatory tone in their public statements, that did not stop officials of both from posing some pointed questions during the closed door discussions. China, worried about its huge investments in the United States, quizzed administration officials about America's soaring budget deficits while the Obama administration pressed China on the need to rebalance its economy to focus more on domestic-led growth rather than relying on exports to the United States. Officials from both nations played down the prospects for any breakthroughs this week on the major issues that separate the two nations, including America's massive trade deficit with China. Critics have blamed the trade deficit over the years for the loss of millions of U.S. manufacturing jobs. President Barack Obama opened Monday's discussions by declaring that the United States sought a new era of "cooperation, not confrontation" with China and that management of the U.S.-China relationship would be a major factor in defining the history of the 21st century. Obama dispatched his top economic officials  Geithner, National Economic Council Director Lawrence Summers, White House budget director Peter Orszag and Federal Reserve Chairman Ben Bernanke  to try to reassure China that the U.S. will not let deficits or inflation jeopardize the value of Chinese investments. U.S. briefers said the president's team told the Chinese that the United States was committed to making sure the economic and monetary stimulus being used to fight the recession did not fuel inflation. U.S. officials told reporters that the American side stressed to the Chinese that the United States has a plan to bring the deficit down once the economic crisis has been resolved. They said Bernanke discussed the Fed's exit strategy from the central bank's current period of extraordinary monetary easing, emphasizing that the Fed was being careful to guard against future inflation. The Chinese, who have the largest foreign holdings of U.S. Treasury debt at $801.5 billion, have been expressing worries that soaring deficits could spark inflation or a sudden drop in the value of the dollar, thus jeopardizing their investments. Chinese officials said those concerns were raised during Monday's talks. "We sincerely hope the U.S. fiscal deficit will be reduced, year after year," Assistant Finance Minister Zhu Guangyao told reporters after the Monday talks had ended. "The Chinese government is a responsible government and first and foremost our responsibility is the Chinese people, so of course we are concerned about the security of the Chinese assets," Zhu said, speaking through an interpreter. The discussions on America's deficits and China's role in financing them highlighted the growing economic importance of China, now the world's third largest economy. The discussions in Washington represent the continuation of talks begun by the Bush administration. While the initial talks focused on economic issues, Obama wanted the agenda expanded to include foreign policy issues such as America's drive to get China's support for more international pressure to curb North Korea's nuclear ambitions. 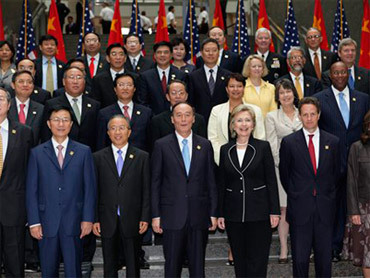 Geithner and Clinton were leading the U.S. team. The Chinese delegation was led by Chinese State Councilor Dai Bingguo and Vice Premier Wang Qishan. David Loevinger, Treasury's senior coordinator for China affairs, said Orszag and Summers both stressed the commitment of the administration to attacking the U.S. deficits. "There were serious questions about what the economic outlook is and ... our plans for withdrawing stimulus," Loevinger told reporters. Geithner traveled to Beijing last month to assure Chinese officials that federal budget deficits, which have ballooned because of government efforts to deal with the recession and stabilize the financial system, would be reined in once those crises have passed. Many private economists have said the Chinese are right to worry about a U.S. budget deficit that is projected to hit $1.85 trillion this year, four times the previous record.